I’ve been doing a lot of research and writing on death practices, the occult, and the act of possession (not like I wasn’t before, but even more so now). It’s made me realize that the art I’ve created in response to my grandfather’s death, initially coming from a place of fear and emptiness, has inspired a more loving relationship with death and the afterlife. To share the love of good death relationships, I wanted to post some pieces from Harboring Darrell, the three-part installation I made toward the end of grad school, in Danielle Vogel’s class, because it was the first time I created art that explicitly spoke of my grandfather’s death: allowing me to start the healing process. The installation includes a funeral, an altar, and a collaborative offering in remembrance of my grandfather, Darrell. It is a companion piece to my project Helene, acting as a direct attempt to move beyond the self experiencing grief and focus purely on the process of grieving. Participants of Harboring Darrell are asked to mourn with me as they view a previously filmed funeral given for Darrell’s boots, interact with an altar created in replication of Darrell’s living room, and leave behind their own memories of loss as they fill out the “Harboring Darrell Questionnaire” and place it in the Box of Offerings. Pictures of the altar and Box of Offerings. Check out this interview my fellow Letter [r] Press editors and I did with Natalie Singer-Velush for the University of Washington Bothell – After the MFA blog. We discuss the beginnings of the press, what it was like to work on the press and journal while attending graduate school, our process of selecting work, what we plan for the future of the press, and more! Two of my self-guided exercises from my thesis Helene (“Exercise 3: Possessor-Possessee Relationship Flowchart” and “Exercise 4: Being Selective with the Proprietors of Your Will”) have been published in issue 7.1 of A Bad Penny Review. You can find them here and here. To give a little background to these pieces, in Helene, I created a fictional religion titled “Possessive Spiritualism,” in which humans can interact with spirits using their bodies as hosts. The titular character’s grandfather has died and she explores possession as a viable option for communicating with her grandfather’s spirit by reading literature created by Possessive Spiritualists. These exercises are pieces from this fictional literature. Try some Bowietry on for size: To skim milk foreigner, determinedly selling his wares and It’s kind of how I feel: a foreign body. I made these collage poems awhile back from images and text related to all things Bowie. The images are layered screen shots I took of Nicolas Roeg’s film The Man Who Fell to Earth. The text is from a few sources: Sean Boyle’s video essay The Sonic Landscapes of The Man Who Fell to Earth, Graham Fuller’s essay The Man Who Fell to Earth: Loving the Alien, and this awesome conspiracy theory essay by Peter-R. Koenig The Laughing Gnostic — David Bowie and the Occult. I hope you like ’em. Note: I initially meant ‘whale’ and not ‘wale’ in To skim, but discovered that ‘wale’ means a plank running along the side of a wooden ship. It’s not the plank one jumps off of when caught and killed by pirates. It also can’t really make songs and rarely interacts with whales. Definitely not whale songs. But let’s pretend all these things. Also, laziness is a thing. The 2015 edition of Best American Experimental Writing just came out, so you can now see my collage poem, For Mercy, in their online issue! It’s alongside some other AMAZING pieces, like Matthew Burnside’s interactive novel, In Search Of: a Sandbox Novel and Blair Johnson’s (what I’m calling a) morphing, crumple poem, “You are only part of yourself, collected in tangles”. You can also buy the print issue, which includes work from Dodie Bellamy (I can say my work has been printed in the same journal as her?? SWOON), Cecilia Corrigan, Bhanu Kapil and Ronaldo Wilson. The journal was edited by Douglas Kearney, guest editor, and Seth Abramson and Jesse Damiani, series editors. I am most familiar with Kearney’s work (SWOON AGAIN), but they all have really awesome stuff. Check it out, and thank you, BAX! This project is on-going and takes the form of a tumblr page called The Creepo Project. The idea for this project came in the Winter of 2014. I was on a run, making my way up a hill, when a person pulled up next to me in their windowless van. They leaned out of the driver’s window, gave me a nod, and slowly said the words “good job.” This wasn’t the first time someone had accosted me while running, or walking, or existing in a public space, or in any context. I started thinking about stories of a similar nature: ones I had heard primarily from women. I wanted to know more. I reached out to friends, family, and the world of Facebook and asked for creepy stories. And the next part of the project is up to you. I need your stories to add to my creepy collections. And there are many ways to provide them! You can either post directly to the tumblr page using your own Tumblr account. If you don’t have tumblr account, you can still post but Tumblr requires you to fill in your name and e-mail address. Either of these options will not post immediately, but they will be sent to my queue for me to approve and they will be up shortly. If you would like to remain anonymous, send your experience to ‘thecreepoproject@gmail.com’ and I will post it for you. The form of your post can be anything you like: words, pictures, videos, songs etc. Letter [r] Press, the small press I am an editor at, has just released Issue 5 of Small Po[r]tions! If you aren’t familiar, Small Po[r]tions is this tiny experimental journal filled with works of all genres. When I say all, I mean poetry, prose, visual art, vispo, video poems, and anything else that starts with a ‘v’ or ‘p’, apparently! I have a link to the online Issue 5 up there, but if you want to buy a print copy (that has more and different pieces than the online journal), click here! Check out this sweet video poem Laura Burgher and I made! We made it special for the TK Art of the City Street Fest (8/1/15). It was in a neat exhibit called Poems for the Street Corner, curated by Ted Hiebert and Kat Seidemann. The video poem is addressed to a combination of things: Detroit, dreams, the corner of 3rd Ave. & Prefontaine PL, Street Corner the franchise, and prostitution. Click on the poems for the street corner link to see the other cool videos that were in the exhibit. 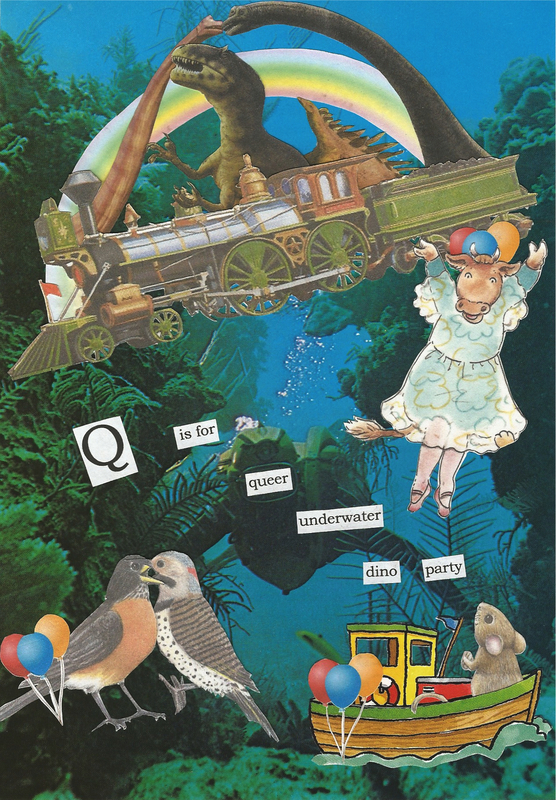 This collage is titled Q is for Queer Underwater Dino Party. I made it for Laura Burgher for her birthday. I cut out images from various children’s books I found at Goodwill. I like the ballerina cow the best. THIS FRIDAY, I am reading from the beginnings of my thesis. This performance will be a combo of “Born Again” Christians, genitalia jokes, and Bettie Page with the help of my friend and collaborator, Andrew Carson. Other people that are AMAZING will be there too. Gallery 1412 in Capitol Hill, 8:00pm-10:00pm. Check it out!